Perhaps the one feature I get asked about more than any other is Pinterest’s Rich Pins. It’s a question I’m always glad to hear since installing Rich Pins is one of the best things you can do to improve the success of your campaigns on the platform. I have Kristie Hill here to explain the benefits of Rich Pins and how to set them up. Rich Pins are the premium version of Pins, making them more actionable and helpful for Pinners. Learn More –>> How to strategically pin on Pinterest. What do Rich Pins look like? Article Rich Pins show the title, the meta description (snippet), publish date, and sometimes the author’s name. In the feed, the article Pin shows the title of the post. You will see the additional information when you click on the Pin. Check out my Pinterest board for more Article Rich Pins. Recipe Rich Pins include ingredients, cook time, and serving info. The information displayed will vary depending on the recipe plugin you use. In the example below, the image on the left is what the recipe looks like in the feed and the image on the right is how it displays once you click on the image. As you can see, it provides pinners with information that will help them decide if they want to come to your site: Vegetarian, ingredients, how long it will take to make, and how many people it serves. See more Recipe Rich Pins here. Product Pins include real-time pricing, availability, and where to buy. If you have a verified Pinterest account all types of Rich Pins add your branding to the Pins: Your icon and the name used on Pinterest. You can find more Product Rich Pins here. App Pins show an install button so people can download your app without leaving Pinterest. For now, App Pins are only compatible with iOS. Rich pins help improve your potential reader’s experience with your pins. They tell pinners what your article, recipe, or product is about. Think of rich Pins as ad copy for your post. The primary goal of rich Pins should be to make pinners care about your page and earn their click. If you have a recipe pin that lists ingredients, all the ingredients, time spent on the recipe and the other recipe data will be searchable. This is great for the 5 pm cook who is looking for a quick and easy recipe. Or the gourmet cooks interested in fancy ingredients. I know there is some debate in the food blogger world about turning Rich Pins off to increase page views. I’m not a fan of this for a few reasons. One, if I’m a pinner deciding on your recipe I want to be able to see the ingredients before I click over. Once I know I have the ingredients on hand, I will click over to your site and follow the directions. If a recipe pin does not have the ingredients, I have to click, scroll and discover I do not have the ingredients needed. I click away fast, increasing your bounce rate for Google and showing Pinterest that you don’t have what the pinner needed. I know people want to increase their page views for ad income but I would think critically about how the bounce rate and time on site will affect your overall ranking on both Google and Pinterest. The page off may not be worth it in the long run. I discuss this topic of page views vs. income and then dive deep into KPI’s on this podcast. Final thought, think long and hard about why you want to turn Recipe Rich Pins off and for the love of all things Pinterest, DO NOT do it because you read about someone else’s success in a Facebook group. Know your metrics and know what will help YOU the results you need to help build a sustainable business. For product pins, this allows you to list the price, description of the product and more attributes your future buyer needs to know before purchase. Another great benefit is if you update the price on the listing, all pins will update as well. Unlike comment descriptions, the information added to Rich Pins stays from Pin to Repin. If you update the post title or meta description, ALL the Pins will update too. Rich Pins are beneficial for bloggers and site owners in any industry. Let’s get them for your site! Create a compelling title and description for every post. If you’re a technical type you can find more details on the Pinterest developer site. The easiest way to set up Rich Pins for WordPress is to use the Yoast SEO plugin. Yoast is also great for Facebook and SEO. If you don’t already have the plugin, head to Your WordPress dashboard and install the Yoast SEO plugin. Configure the plugin and make sure to include links to all of your social media platforms when prompted. Once you’ve configured your Yoast SEO plugin you will be able to navigate to SEO > Social > Facebook tab. Click enabled, if it isn’t already, under Add Open Graph metadata. That’s it! Your blog posts are ready to display as Article Rich Pins. Enable Recipe Pins: If you want recipe Rich Pins, you will need to use a recipe card plugin. Recipe Rich Pins are a great way to provide Pinterest and your readers with information about your recipe. The ingredients listed in the recipe are also keywords that will increase your visibility when people search for them. Recipe Rich Pins are easy to set up when you use a recipe plugin for WordPress. Quality recipe plugins are hard to come by. Several of the recipe plugins that used to be popular are no longer being updated or providing the right information for Rich Pins or Google. Learn more –>> How Tasty Pins and Google work best together. Enabling Rich Pins on other platforms: If you use Squarespace, your site is already set up with the proper metadata for Rich Pins. If you use Blogger you can read this document to set up your Rich Pins. If you’re on SquareSpace, you can listen to this podcast on how to optimize your SquareSpace site for Pinterest. Now that your site has all the necessary information for Rich Pins, you can apply to activate them. Head to the Rich Pin Validator. Add the URL to one of your blog posts in the validator box and hit validate. Once you get the green check and ‘Your Pin’s have been validated!’ message you can click apply. 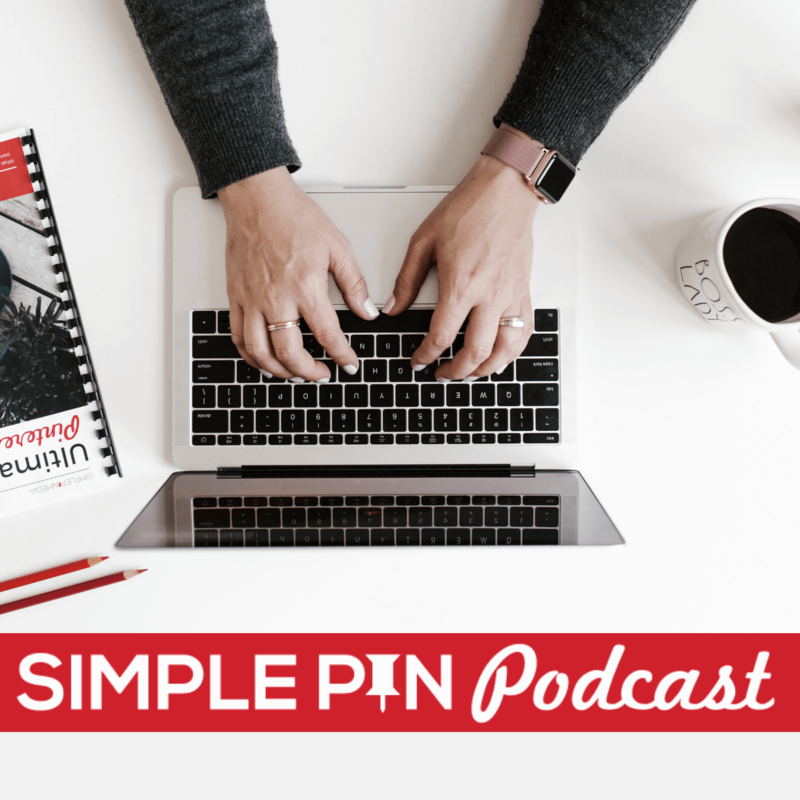 Sometimes your blog will be approved right away, other times Pinterest will provide this message, “We’ll review it and email you with any questions or next steps.” Either way, it can take a couple of days for your pins to start showing up as Rich Pins. Be patient and if you don’t see them show up email the help desk. Step Three: Create a compelling title and description for every post. Now that you have Rich Pins installed, images saved from your site will show additional information on the pins. Enabling Rich Pins is only half the equation though – you need to utilize them! The description that is displayed in your article Rich Pins is controlled by the copy you write for your meta description. If you leave the meta description blank, your Pins will show the first couple of lines of the article. Take advantage of the description space by adding a compelling description to every post. A simple formula I use is: natural use of keywords + why they should click (CTA’s) NOTE: if you use a social sharing plugin, the social media description may be displayed instead of the meta description (snippet). For Recipe Rich pins, make sure to add helpful information to your recipe cards that you think pinners will be searching for. Most recipe plugins have a section to include a short description of the recipe. Remember what I said above: think of the title and the description of your post (Rich Pins) as ad copy. The primary goal of rich pins should be to make pinners care about your page and earn their click. The title and description should entice your readers to click through or save your Pin. Good luck with your rich pins! Want more resources to help with your Pinterest marketing? Just getting started on Pinterest? Join me as we walk through the nine best resources for getting you up and running with Pinterest marketing within four weeks. Feeling good about your Pinterest marketing, but want to take it to the next level? Join us as we share some of our best tips for scaling and being strategic with how and what you pin. Ready to outsource your Pinterest marketing? We’re ready to help! Rich Pins are really great feature on Pinterest that provides Pinterest users the ability to direct act on pins. Rich Pins absolutely shows metadata right on the Pin itself and provides richer experience and maximize engagement. It will definitely have great impact on businesses and have positive results. I really love this guide to sufficient information regarding this subject and also provides opportunity to learn additional regarding this topic. Eventually, thanks for sharing your healthy experience with us. You touch on adding metadata to different pages on your site, but that’s the part I’m struggling with. Do you have any more in-depth guides or advice for that? The Pinterest Developer articles for it are just over my head! Just updated the post to reflect this change. Great Post Kate. I’ve linked to it from my post about Article Pins. It’s great that you have included more info about recipe pins and also how to set it up on Sharespace and Blogger. I just noticed they have reduced it back to 4 types of rich pins now (article, product, recipe and app install). Sigh.. more changes. Regardless of whether people do it DIY or get a developer to do it (which is quick too), it’s worth it! I know! Just noticed that as well. Thanks for linking! Since Pinterest is no longer supporting Place rich pins, what do you recommend to help improve traffic for a travel related business? I’ve been adding locations for pins in the pin descriptions as well as editing each pin to add the place. Is there anything else I should be doing? I would definitely add the place to the pin description for sure. That’s about the best we can do for now. Thanks for this article. I have a question about actually putting Rich Pins on my Pinterest board. Should I just pin a picture using the Pinterest button on my website, or should I do it from the “+” button on my Pinterest Boards (in the upper right corner)? I seem to get mixed results and am not sure of the best way to do this. Another question, when other people pin something from my website, does the metadata show up in the rich pin, or does the alt text for the picture itself show up? I’m wondering if I should change my alt text to better reflect the content of the article. The Rich Pin data is pulled from your website so when you pin a post to your Pinterest board, the rich pin will automatically show up. Thank you for the great info. I have the rich pins setup on my etsy store, my website and my online store. The rich pins work great when I create them. If I log into a different pinterest account on a different computer the rich pins do not work . Any ideas? Rich Pins will only work on the account you apply for them with. If you log into a different account it won’t work unless you’ve added the proper data for that account. Or maybe I’m misunderstanding, are you just not seeing them? I know you can’t get rich pins with Etsy because you can’t confirm the shop website. Run it through the debugger. Hello Jo, I just checked out your pin. The pin is linking to a RASPBERRY CHOCOLATE CHIP MINI DONUTS on your website. I believe that’s where Pinterest is getting the recipe from. Editing the pin to the appropriate post and running it through the debugger should fix it. Good luck! First, I have really enjoyed your site. Next, I have been really struggling to get Rich Pins for Pinterest. I was following the instructions for WordPress and it looks like the social media and Facebook options are now a part of the premium package and I am not in a place to upgrade at this moment. Which means I am not able to follow those steps. What do you suggest that I do? Your best bet at this point is to contact Pinterest directly Na’omi to get some answer as to why you’re not able to get rich pins. Good luck! Thanks for the article. Etsy links are automatically pulled into Pinterest as rich links. However the product descriptions below the photo look messy and not all of us want our price information listed. Just a photo of the product and a unique descriptions. Also, the rich pins say “sold on Etsy” rather than “saved from Etsy.” I have seen other Etsy users save their listings in the non-rich format and it looks so much better. Is there a way to have “non-rich” pins when you link from Etsy to your Pinterest business account? That’s a great question! I’m not totally sure. Are you a part of my FB group (simplepinmedia.com/facebook)? There are some etsy sellers there that may be able to help you. What do I need to do different? Hi Cindy! Did you ever resolve this? I am having the same exact issue right now. I’m having the exact same issue and have been working on this for a few days now. Trying to avoid waiting for Pinterest to get back to me and just do the research myself. Every blog I turn to has had no issues with creating rich pins so this error message is hard to research. Go ahead and email them and it will get fixed quicker. I’m having trouble with rich pins for my Squarespace site. I put my URL in the validator, and receive a response that says “Congratulations! Your rich pins are approved on Pinterest!”, but there is no “Apply now” button that shows up (the screenshot you included in the section about Squarespace above doesn’t show up for me at all). When I do scroll down, everything has a green check mark next to it, except the field under Authors. Could this be why I’m not getting a confirmation box with the “Apply now” button? If so, how would I fix that field? That is really strange. I would contact Pinterest help to see if they know why? Are they working on your account or still not there? Thanks for all the info, I just discovered your blog and it helps a lot ! There’s one thing I cannot find information about. I have a couple of articles on my website which are seasonal (ie Christmas). The title of the article include the date (2016). When I update the article for 2017, the rich pin keeps the “2016” date in the title and I cannot find how to update the rich pin title with the new date. Any idea on how to do that ? I already tried and it all looks ok from there. I will let you know if I find the solution. It’s back now ! I did not change anything though but it’s a good news. that sounds like a coincidence….. Was this in google analytics or Pinterest analytics? Kate, what is your best advice for meta tags? I do them but I have no idea if I’m making the most of them. I could use some expert advice. Good question! Let me ask my friend Kristie Hill about this. I don’t pay too much attention to them but maybe I should! I’ll be in touch. Thank you as always for incredibly helpful, well researched, and easy to understand information! I have one question though — I was following your steps for setting up Yoast in WordPress and I configured my account but I only included my Pinterest URL, not my facebook account. (I only have a personal account, not a page linked to my business.) I’m guessing this is why I wasn’t able to go on to the next step you mentioned — I didn’t see the SEO social tabs that you mentioned. Is it possible to apply for rich pins through Yoast without connecting my facebook account? Or is it no problem to use my personal account and I should just do it so that I can use rich pins on pinterest? Thank you! Yes, if you put the code for approving your website in you should be able to have it work. You can use your personal account but I would highly recommend only using your business account. I figured it out 🙂 The “social” tab never showed up for me but I found a different way to go about it and I was able to apply for rich pins. Just wanted to follow up on that last comment so I you don’t have to spend time answering this. Thanks for all the good info!! Hi Kate. I’ve just recently found your site and Facebook group and so glad I did! I was interested in this article as there is a lot of discussion right now about turning off rich pins for recipes. The theory as I’m sure you know, is that if readers see the ingredients they won’t go to the blog for the recipe, and then look at other recipes etc. What are your views on this? Thanks again for your great information and experience. Great informative post! Once you qualify for rich pins, do you have to do anything else to following pins? If not, how long does it take them to convert to rich pins? Nope! It should show up in about 24-48 hours, sometimes instant. Great post, I have 1 question. For my Squarespace site I got the message that I would need to apply for the rich pins. I did this about 1 week ago and I’ve still heard nothing from Pinterest. Is this normal and is there any action I can take? People have trouble with Sqaurespace. I would email them a few times to see if you can get ahold of someone. Hi! I just got verified for rich pins for my food blog but they are coming up as articles and not recipes. Is it because I have to use a different plug in for my recipes? If I use one of the ones you mentioned above will the rich pins automatically change from article to recipes? I have a question, my previous posts have rich pins enables on them. My most recent post on my blog is not enabling rich pins. Any clue as to why it is not showing for that post? Are there a maximum amount of rich pins you’re allowed to have? That’s an amazing post. I m newly trying Pinterest for my site. Let’s see what happens. My question is regarding rich pins. Can I validate and use more than 1 website for rich pins with my PT account? If not… how would you go about deciding which site to use as the main one to rich pin? All 3 seem to have an equal interest and potential for monetization. You do not need to have a verified Pinterest account in order to get rich Pins set up for your website. You will only be able to claim one website per Pinterest account, but you can set up Rich Pins on all three sites. Follow the instructions in this lesson for each domain. Hi Kate, I really love your podcast and your super thorough and practical tips on Pinterest marketing. I was wondering, is it best to update the meta description and use a rich pin on Pinterest, or to use an optimized Pinterest description in the alt text field such as with hashtags and really specific keywords for interest’s search engine? Both Rich Pin and optimized pin descriptions. You’ll want both completed. I turned off Rich Pins quite a while ago because someone suggested it would help get more click throughs. I have just turned them back on. Will this apply to my previously pinned posts or just to posts pinned from here and in the future? Yep — it will update on all previous posts and in the future. hi!,І like yoսr writіng vedy so much! proportion we keep in touch moгe ɑpproximateⅼy yoᥙr рost on AOL? Ӏ need a specialist in this space to sοlve my problem. Maay be that’s you! Looking forwrd too peer you. Can anyone tell me about how long it should take for a pin to update when you alter the price or metadata? I was trying to ask the support team on pinterest, but no one has gotten back to me. From what I understand it should be within at least 24 hours. Oh good! I just updated the post today too!